A fond farewell and warm welcome were expressed by enthusiastic and extended applause during a press conference to announce the new archbishop of Indianapolis on Oct. 18 at SS. Peter and Paul Cathedral in Indianapolis. Archbishop Emeritus Daniel M. Buechlein, now living at Saint Meinrad Archabbey in St. Meinrad, waved in acknowledgment as several hundred people at the press conference gratefully thanked him with heartfelt applause for his distinguished pastoral service to the Church in central and southern Indiana during the past 19 years. Archbishop Tobin’s episcopal motto is “Gaudete in Domino,” which translates as “Rejoice in the Lord” and is taken from St. Paul’s Letter to the Philippians (Phil 4:4). He reflected that joy during the press conference. In a light-hearted moment at the conclusion of his prepared remarks, Archbishop Tobin smiled as he held up an Indianapolis Colts scarf given to him by Archbishop Buechlein then said he accepted this mantle gratefully and promised to support the National Football League team. After putting the Colts scarf around his neck, Archbishop Tobin walked over to Archbishop Buechlein and thanked him for his gift as well as his exceptional leadership of the archdiocese for nearly two decades. “I’m happy for him,” Archbishop Buechlein said after the press conference, which symbolized the start of the official “passing of the torch” from the Jasper, Ind., native and longtime shepherd of the Church in central and southern Indiana to a former Vatican official returning home from Rome to minister in the Midwest. Smiles were plentiful among the archdiocesan employees, who were glad to see their beloved archbishop again and excited about the opportunity to serve with a new spiritual leader. 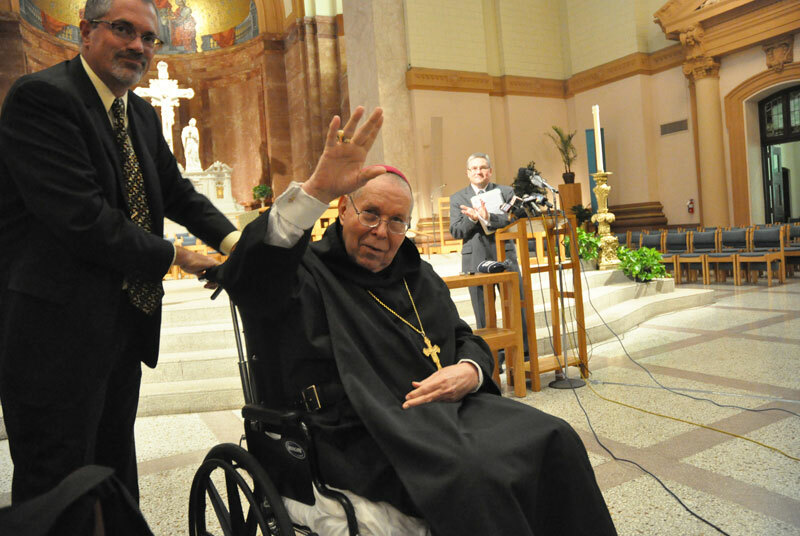 Archbishop Buechlein’s early retirement for health reasons on Sept. 21, 2011, following a bout with cancer then a stroke, temporarily elevated Bishop Christopher J. Coyne from auxiliary bishop and vicar general to apostolic administrator. Father Gerald Kirkhoff, archdiocesan vicar for advocacy for priests and pastor of Good Shepherd Parish in Indianapolis, also noted the “new beginning” for the archdiocese. More than 30 of the archdiocese’s 95 active priests attended the press conference. Father Thomas Kovatch, pastor of St. Charles Borromeo Parish in Bloomington, was among the clergy who had been ordained to the priesthood by the archbishop emeritus. 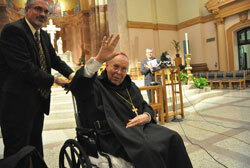 “It’s always good to see Archbishop Daniel,” Father Kovatch said after the press conference. “He’s really been a father figure to me the whole time I’ve been in the seminary and as a priest. I’ve got a feeling that our new archbishop is going to be that same father figure for the seminarians and priests so I’m excited about that. “For us as priests, it’s a joy to have an ordinary now because we really can’t function the way we should without an archbishop,” Father Kovatch said. “Bishop Coyne has done a great job in bridging that gap for us. We’re excited now and ready to move forward.